Please report any issues on https://github.com/netrunner/netrunner-1212-feedback/issues or in the forums. We have started to work on the next version of Netrunner called Dryland – Third Edition (12.12). It is based on Kubuntu 12.10 and as the version number indicates, we plan on releasing the final version in December. We will also follow the October release of Kubuntu with a Netrunner 12.12 Beta 3-4 weeks later, then take another 4-5 weeks for the public release. So from now on, Netrunner will follow an official release cycle with fixed dates for all further releases, giving us +8 weeks time between each new Kubuntu release and the Netrunner release. That means Netrunner will feature a new version number system starting with Dryland TE (12.12), then Netrunner version+1 (13.06), Netrunner version+2 (13.12), and so on. Netrunner 4.2 Dryland – Second Edition released! Netrunner Dryland SE has been released. Netrunner Dryland SE RC ( Relesease Candidate ) has been released. Netrunner 4.2 called “Dryland – Second Edition”. As the name indicates, it will continue on the Dryland cycle, yet be a full release that includes all the latest stuff from precise pangolin (and then some). Since it is based on upcoming Kubuntu 12.04, we hope to have it ready 2 weeks after their official release. An upgrade tool is also being tested to allow upgrading from Dryland -> Dryland SE. Vandaag is Netrunner 4 64 bit uitgekomen. Netrunner is gebaseerd op Kubuntu ( Ubuntu met de KDE desktop ). Our first 64bit version of Netrunner 4 Dryland is here! It’s also our first hybrid disk image! It has the same features than the 32bit version with current stable KDE 4.7.4, Muon 1.2.95 (which fixes the package management issues) and GTK2+GTK3 configurator “kde-gtk-config” preinstalled. Just grab a copy from our Downloads page and Happy Runnin’ for the weekend! De laatste dagen wat met Netrunner zitten spelen. Netrunner is een Linux distributie gebaseerd op Kubuntu ( Ubuntu met de KDE desktop ). De installatie gaat hetzelde als bij Ubuntu / Linux Mint, alleen zit hier geen slideshow bij. Na de installatie heb ik het menu gelijk vervangen door de Kickoff Application Launcher. Netrunner werkt erg prettig, iets wat ik vroeger beslist niet vond van KDE, wat dat betreft heeft KDE ( naar mijn mening ) echt vooruitgang geboekt. Otherwise you risk breaking your system and not be able to start KWin after login. We are working on a solution to fix this automatically. 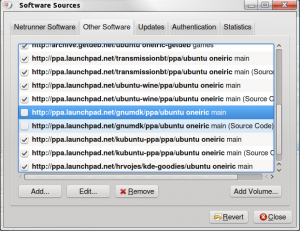 a tutorial by Clement Lefebvre, project leader of Linux Mint.